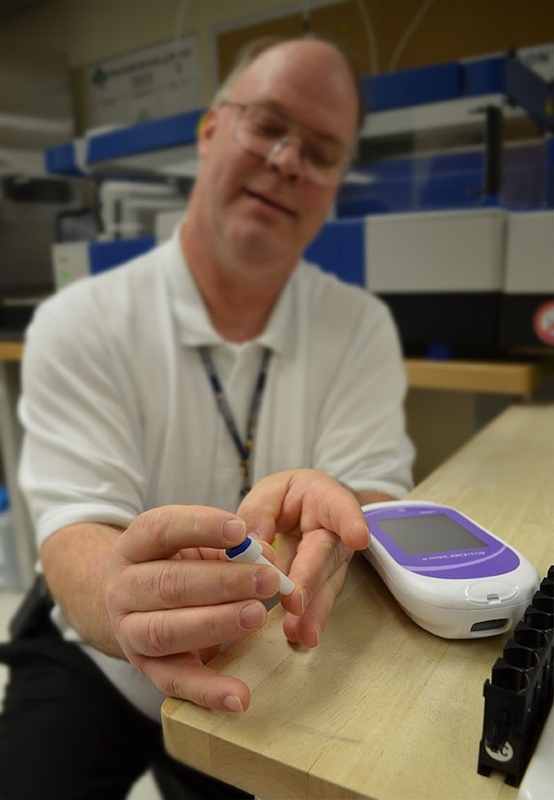 Bryce Stewart, a laboratory information specialist, demonstrates Wyoming Medical Center's new glucose meters. He caught his own type 2 diabetes when volunteering for a test in a training session and now advocates for diabetes screenings. About four years ago, Bryce Stewart was teaching a class of nurses how to use the hospital’s glucometers, devices that measure the concentration of glucose in the blood. He volunteered his own finger. Though he hadn’t eaten anything that morning, his fasting blood sugar came back at 250. His normal range should have been between 60 and 95. “I had no idea my sugars were running that high. It was kind of a shocker that day. Kind of a happy accident,” said Stewart, a laboratory information specialist at Wyoming Medical Center. By volunteering his finger, Stewart’s type 2 diabetes was caught. He manages it through pills and lifestyle, but doesn’t have to inject himself with insulin. He believes his story is a good lesson in the advantages of early detection. “People used to have yearly doctor’s visits and they don’t anymore. Doctors would find things like diabetes. I’m a big proponent of screening tests,” Stewart said. Stewart also oversees the bedside blood glucose monitoring system used at Wyoming Medical Center. We recently switched to the Accu-chek Inform II glucometers to better monitor blood glucose levels of diabetic patients. The new meters give results in 5 seconds for the bedside, allowing caregivers and patients to make instant decisions about medication and care. They wirelessly upload results to the patient’s electronic medical record every 10 minutes so they are visible to all caregivers. “This helps prevent swings in their glucose levels and this is very important to us and our patients,” Stewart said. Since adopting the new system three weeks ago, WMC providers have administered about 7,000 blood glucose tests at patient bedsides. As a diabetic himself, he understands the importance of keeping track of glucose levels. And, he wants to remind readers to get your yearly screenings – for diabetes and a host of other health conditions. Talk to your doctor, or take advantage of local health fairs. He admits that he had skipped a couple of the health fairs before the accidental test uncovered his diabetes. “People need to keep an eye on it because it sneaks up you,” he said.